We have worked for over 200 city authorities on air quality and emissions policy. This work is underpinned by our detailed understanding of pollutants and their behaviour, and the use of our city-scale air quality modelling tool – RapidAir®. 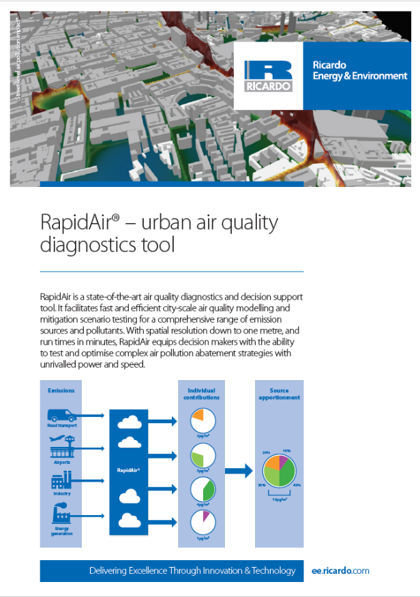 As an operational air pollution tool, RapidAir provides advanced air quality diagnostics and abatement scenario testing capabilities – equipping you with the tools to develop effective air quality management strategies. Modelled pollutants include gases (nitrogen oxides (NOx), nitrogen dioxide (NO2), sulfur dioxide (SO2) and carbon monoxide (CO)) and particles (PM10 and PM2.5) with accurate concentration (mass and volume) predictions over domains that span street, city, regional and national scales. RapidAir integrates local emissions, meteorology and measurements to ensure a complete representation of urban air quality and supports modelling of emissions from all of the common source sectors (e.g. transport, industry, construction, demolition and landfill). 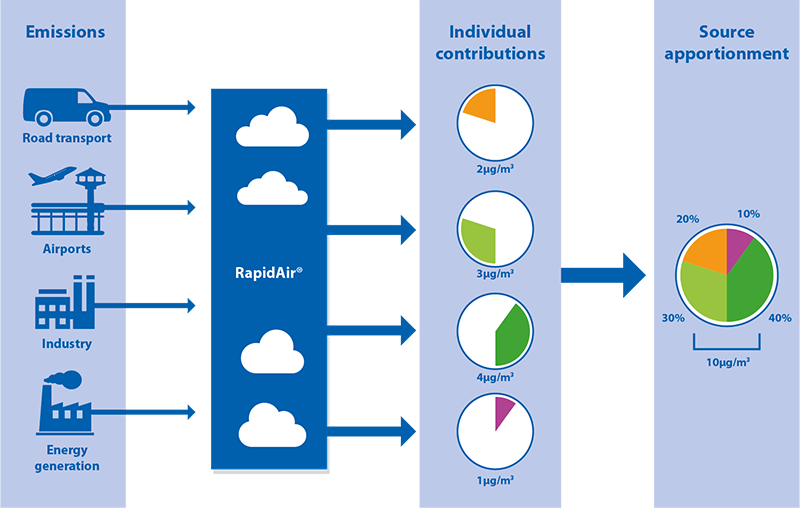 RapidAir can be configured to serve data to online visualisation platforms or client websites, so providing decision makers with detailed insight into the key emissions sources that contribute to air quality pollution standards being exceeded. In addition, its powerful scenario analysis tools support the development of air pollutant mitigation strategies. 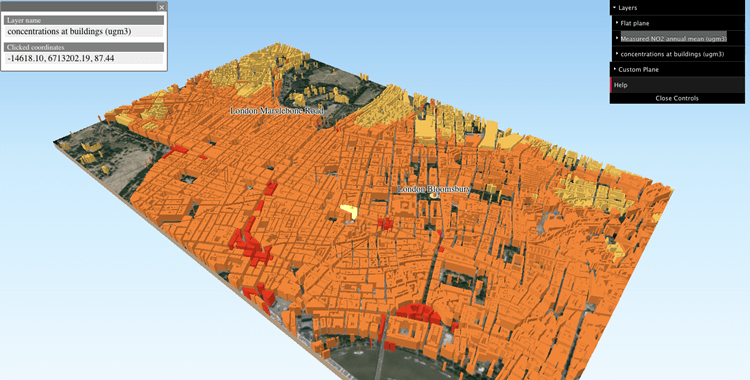 RapidAir enables the impacts of ‘business-as-usual’ and alternative mitigation scenarios to be quickly visualised over city or street-level scales. RapidAir offers a holistic approach to solving air pollution problems. This provides decision makers with confidence that a plan delivers a solution rather than simply displaces a problem to other locations within a city. Current air pollution conditions using state-of-the-art modelling techniques. 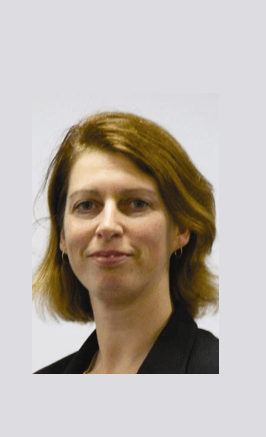 The assessment of planning and permit applications, and identifying and managing the effects on air quality of industrial facilities, infrastructure developments and traffic-generating development. 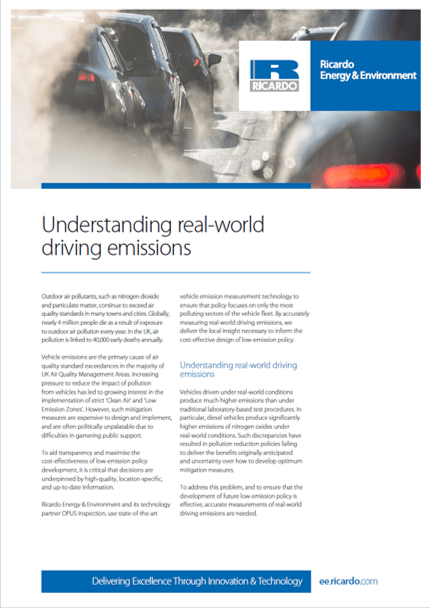 When RapidAir is used in conjunction with Ricardo’s real-world vehicle emissions service, a deeper understanding of emissions and their control can be gained. Visualisations used on this page use © OpenStreetMap. The data are available under Open Database Licence and the cartography in map tiles is licensed as CC BY-SA - refer to www.openstreetmap.org/copyright for full licence terms.